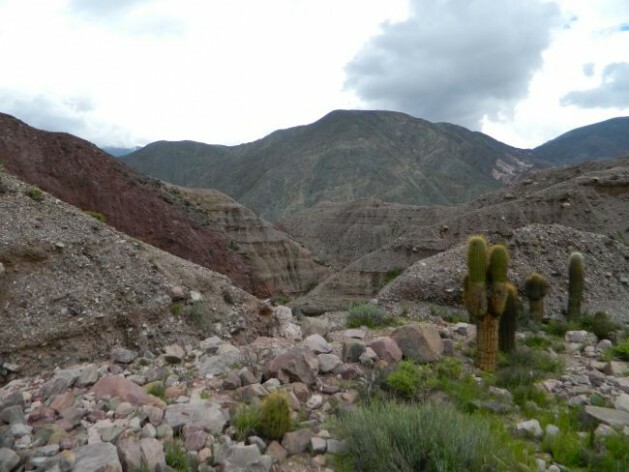 BUENOS AIRES, Aug 7 2012 (IPS) - The arid high Andean Puna plateau in northwest Argentina was much greener thousands of years ago. Climate changes forced the local inhabitants to develop adaptation strategies that could offer lessons for today, researchers say. “The Puna region was always a desert area. But until about 10,000 years ago, there was greater vegetation coverage and the productive parts were much more abundant, because it rained year-round,” archaeologist Hugo Yacobaccio of the University of Buenos Aires (UBA), told Tierramérica*. But changes that occurred over the space of thousands of years left the Puna region extremely arid. According to the evidence, one of the factors that played a role was the El Niño/Southern Oscillation (ENSO), a cyclical phenomenon in which the surface temperatures of the equatorial Pacific rise, which has been occurring for at least 3,000 years. But the period 6000 to 2000 BC was characterised by extremely arid conditions at the planet’s lower latitudes. “That is when the Sahara Desert was formed in the north of Africa, in an area that was previously savannah,” said Yacobaccio. The inhabitants had to adapt to the new challenges. “The mobility of groups of hunter-gatherers was reduced and relative population density rose as they grouped around small oases or ecological refuges,” said Marcelo Morales, another archaeologist at UBA. Paleoenvironmental studies have provided evidence that during that period, the human presence in those areas significantly shrank, but did not disappear. “The ultimate objective of these studies is to better understand how society functioned thousands of years ago, in relation to climate changes, and draw on that for lessons in the face of global warming today, which is much more accentuated,” Morales said. The two researchers work at UBA’s Institute of Archaeology and the National Scientific and Technical Research Council, in the area of environmental archaeology – the study of the long-term relationship between humans and their environments. They have published several studies on an environment and time period that are important for different reasons. The Puna altiplano region extends, with different names and characteristics, through southern Peru, northeast Chile, western Bolivia and northwest Argentina. The Argentine portion, peppered with salt flats, is one of the most arid parts of the Puna. It is also, Yacobaccio explained, one of the few regions of the world where evidence of an autochthonous transition of hunter-gatherer groups to more sedentary and complex societies dedicated to plant cultivation and animal husbandry can be observed. “This transition can be found in five or six places around the world, and it spread from those few sites to the rest of the world,” he added. The other sites where the transition has been documented are in the Middle East (Israel, Syria and Turkey), China, Mesoamerica (southern Mexico and northern Central America), and Peru, he said. Desert systems are very fragile, with no buffer against abrupt climate swings. “That’s why we believe these changes definitely had an impact on the populations, because streams and wetlands disappeared,” he said. Vegetation became sparser and prey animals dispersed. Some inhabitants migrated, and others began to understand that it made more sense to stay for longer periods in more suitable areas, where supplies of basic resources like water, food or sources of energy were available, Morales added. These places were nearly always over 4,000 metres above sea level, where there were still wetlands, streams and rivers. “Whereas before they had moved about in groups of around 15 people, now groups of as many as 70 people came together in those areas, and that marked the start of experimentation with certain economic practices like the domestication of camelids” – guanacos and vicuñas, which were the main wild mammals in that region, he said. And to a lesser extent, they began to cultivate species like squash, quinoa, and potatoes and other tubers, he said. “All of this brought about a change in habits, because those refuges where they could graze their animals, cultivate vegetables, and find firewood were isolated areas separated by deserts,” Morales explained. In their field research, the scientists have found evidence of incipient villages, and artifacts of tools, bags woven from vegetable fibers and crops adapted from the valleys. As the climate was modified, hunting strategies also changed: it became a group rather than a solitary activity, which used lookout perches. There was also greater planning involved, as well as more intensive processing of the prey. The groups that settled in wetland areas “began to play a greater role in the selection of animals for domestication, selecting the tamer ones, and that had an impact on the animal populations,” the archaeologist said. Other researchers working in the most arid parts of the Puna, where salt flats abound, are replicating an irrigation system that is thousands of years old but has proven to be effective today. “The idea is to extrapolate from past experience, to come up with new alternatives and improve current practices in the face of climate conditions that have become harsher,” Morales said.